It struck me. One of our best sales guys didn’t understand social networking. Yes he was on LinkedIn. Yes he was part of groups. And most probably also on Facebook. But he didn’t understand the power of social networking. He just didn’t get it what happens when he would “like” an update of the company he was working for. But there is much more to understand how this sales guy, and the rest of the reach of your organisation, can have a massive resonating impact. In this blog post I’ll show what a simple, orchestrated “like”, can do for your company. 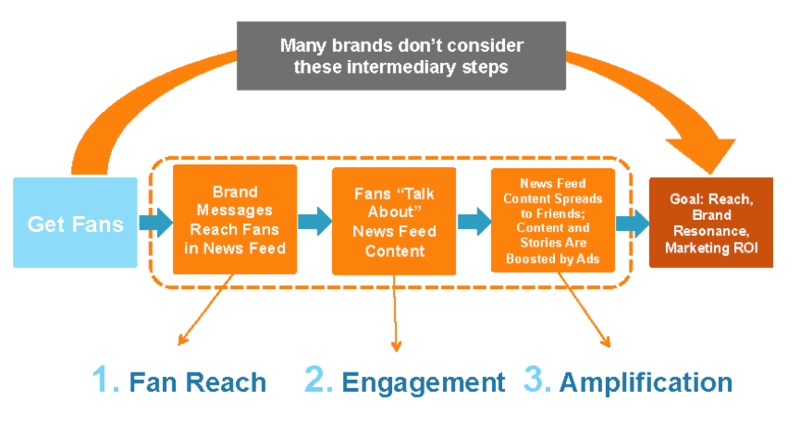 Fan or Follower Reach : For brands to resonate on social networks, the first step is literally to be seen. While brands have the opportunity to communicate directly with their Fans through the News Feed, not every brand message delivered results in an exposure to a follower or a fan. Facebook uses an algorithm to help optimize the messages users see in their News Feed, and while the exact algorithm is not public information, it is clear that relevance plays a role in message visibility. LinkedIn is probably using a similar algorithm, you can see this yourself when checking the updates on your companies LinkedIn page. You’ll notice that the number of “impressions” vary. So brands in which consumers engage more regularly, whether through a comment, share, like, or check-in, have a greater likelihood of being seen on the News Feed, otherwise known as Fan Reach (or “cut-through”). Engagement : Engagement with brand messages – such as a like, share, post, check-in, etc. – has recently become a hot topic of discussion in the social marketing arena. A recent study demonstrated that only a small percentage (typically around 1 percent of Fans) actually engage with a given brand message. Even considering this small percentage, the effect can be massive. This effect is called Amplification. Amplification : The top ten corporatebrands had an average Amplification Ratio average of 1.05 (Range: 0.42 to 2.18). The top 100 brands (excluding Celebrities & Entertainment) had an average Amplification Ratio of 0.84 (Range: 0.06 to 2.87). Your company has 250 employees. Your company LinkedIn page has e.g. 1000 followers. 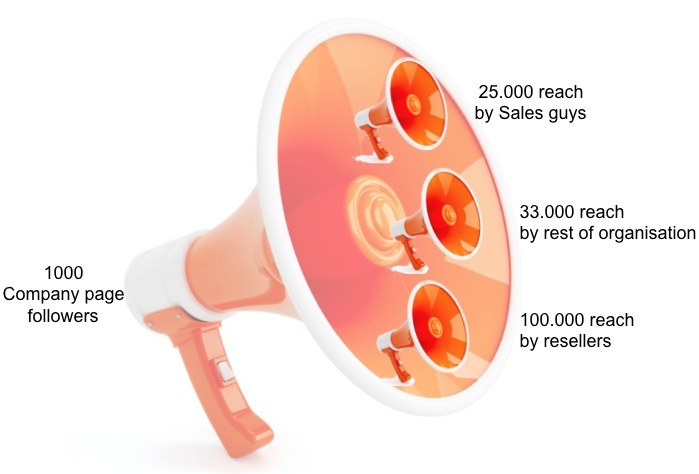 Let’s assume your company has 25 sales guys with each of them about 1000 followers. Each time your company post an update, every sales guy is asked to “Like” your posts. By liking this, they amplify the update to their own followers. So now the reach is about 25.000 followers. Assume that the rest of your organisation, about 225 people all have 150 followers on LinkedIn. 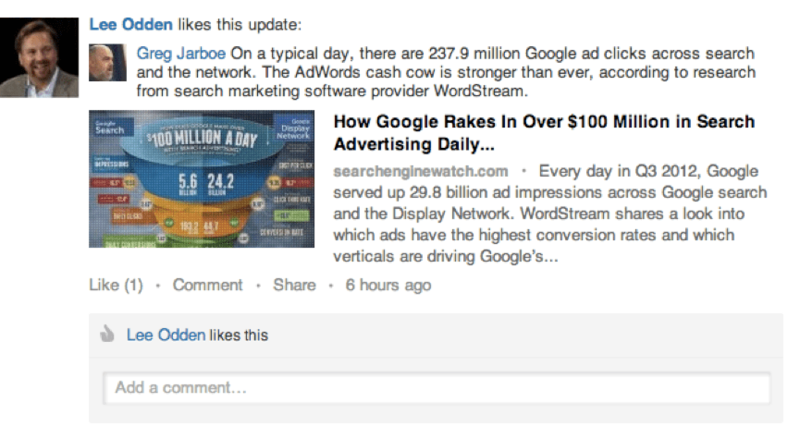 When each of them amplifies the updates, you would have about 33.000 extra reach. In this ideal scenario, you end up with about 217.000 people you can reach on LinkedIn ! Your started with a reach of 1000, and you end up with 217.000 ! In practice, the reach of an orchestrated like will be lower. Many factors reduce the reach, like overlapping social networks (people knowing the same people), the willingness of your organisation and reseller network, the relevancy of your updates to the networks, and impression algorithms. Every individual in your organisation should understand the power of his “Like”. Your task as a manager is to let people understand the power of their engagement with the social updates of the company. And then orchestrate the “Like”. This is the power of social networking.